BlizzCon is always more exciting, for me at least, on odd numbered years, and the reason is obvious enough: it is when Blizzard have historically announced the next expansion in the World of Warcraft franchise. Not so in 2015. With a great deal of “huh?” and “did something important happen a few weeks ago?”, Warcraft gamers have been slowly coming to learn of Legion, which was announced at a convention in Germany back in August. I enjoyed it. Watching Sylvanas duke it out with the demon got me fairly excited. But if this was all you had to go on, you would have approximately zero idea what Legion was about save exactly what its name implies: The Burning Legion. In that sense, the opening ceremony to BlizzCon 2015 was rather disappointing. I was expecting a broad four minute cinematic showcase of the new world that Legion would open up. Instead I got a narrow four minute cinematic showcase of Varian and Sylvanas fighting demons. Meh. Cool video; not what I was hoping for though. Where Warlords of Draenor left off, Gul’dan had opened a portal for the Burning Legion to invade alternate-reality Draenor and the horde and alliance had stopped it, but Gul’dan escaped. In Legion, he arrives in main-timeline Azeroth and heads to the Broken Isles–a remnant of ancient Suramar which holds the tomb of Sargeras–under orders from Kil’jaeden. (Sargeras is basically the highest-tier bad guy in WoW lore–a titan who turned evil and commanded the Burning Legion. Basically, Kil’jaeden’s boss.) A portal is opened, the invasion begins, and here we are. Oh, and Illidan Stormrage is back, because why not? Illidan’s role is going to pick up from Black Temple. Blizzard are retconning the invasion of the Black Temple in Burning Crusade to say that Illidan opened a portal to a demon prison world (Mardum) and sent the future-Demon Hunter class elves on through. Inside, they infuse themselves with fel energy in a way that does not bend their will towards the Legion. (In practice it’s something akin to Death Knights–a horde/alliance aligned variant of a traditionally evil class–and they’ll begin at level 98.) The Demon Hunters return to the Black Temple just in time to be defeated by the horde/alliance and imprisoned by Maiev. Their plot line resumes in the present, where they break out of the Vault of the Wardens and choose their factions. That was all Blizzard had to say about the main plot overview. But when they got into discussing different zones, things got interesting. Apparently, Legion is going to double up as the Emerald Dream expansion. (I’m kind of torn on that because I always hoped it would be its own independent expac.) Basically, the Emerald Dream is an alternate dimension containing the blueprints of Azeroth as it was first formed. It’s where druids derive their power, and Ysera and the green dragonflight existed to protect it. For about as long as WoW has existed, it’s been plagued by a mysterious corruption, and in Legion we finally get to engage that head on. 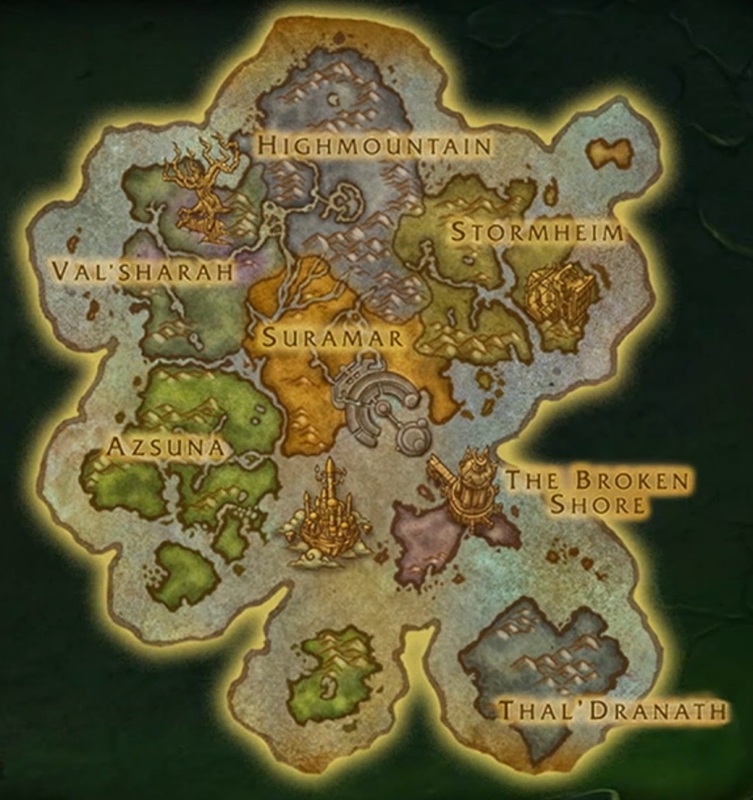 Legion will begin with a 40-player scenario sequence (I cringed at the thought of how queues for this might work months after the launch when most players have already done it) where the alliance and horde invade the Broken Isles and establish their footholds. Blizzard showed a video of it. It looked, well, pretty damn awesome. The problem is, you don’t explore them in a set order. Blizzard got it in their heads to use the scaling technology we saw a lot of in Warlords and make all mobs scale as you level, so you can choose which order you tackle the zones in. It sounds like an absolutely terrible idea to me. First of all, so much for going back and finishing the story lines in lower level zones once you’re strong enough to speed through filler “kill 15 of x” quests. They’re now guaranteed to be a tedious waste of time no matter what your level is. Yay! And this is going to be an absolute nightmare for pvp servers. Seriously. At least before, players 10 levels above you had to go out of their way to find you and pick a fight instead of taking on players their own size. Now a level 100 and a level 109 will routinely find themselves doing the same leveling quest. It doesn’t stop at that, either. It was later mentioned that, thanks to scaling, areas can function as both leveling zones and end-game questing areas. Uh, thanks Blizzard. There’s nothing this dwarf loves more than competing to complete a quest at level 100 against three full-conquest geared horde at level 110. Like it or not, daily quests are coming back with a vengeance. I absolutely loved command table missions in Warlords of Draenor, because you were pretty free to do whatever you wanted within the mission area and gain credit towards the same objective. Legion‘s variation didn’t sound particularly bad though. Instead of picking up dailies from a central hub, there will be daily quest regions with objectives listed on your map–presumably dozens of them–and you can pick from a huge variety throughout the continent to do whatever you’re in the mood for on a given day. Blizzard described their intention as to “overwhelm you with options”. And I like that. Part of what made Warlords of Draenor the most fun thing Blizzard has created in a long time was this sense that you never had to do the same content twice or run out of activities. I get the impression that in Legion they are taking that idea and pushing it even further. The more significant rewards of dailies won’t be “daily” in the traditional sense, either. They will be something more like “complete six of the dozens of daily quests in a given zone this week.” So you should never feel obligated to actually play every day in order to keep up with the content. As someone who likes to be geared for raiding early in an expansion but can’t be on every day, I really like that. Blizzard announced two raids for Legion. The first is The Emerald Nightmare, which I’m really looking forward to because the Emerald Dream is an obscure bit of WoW lore that’s intrigued me for years. We’re finally getting to see it out. 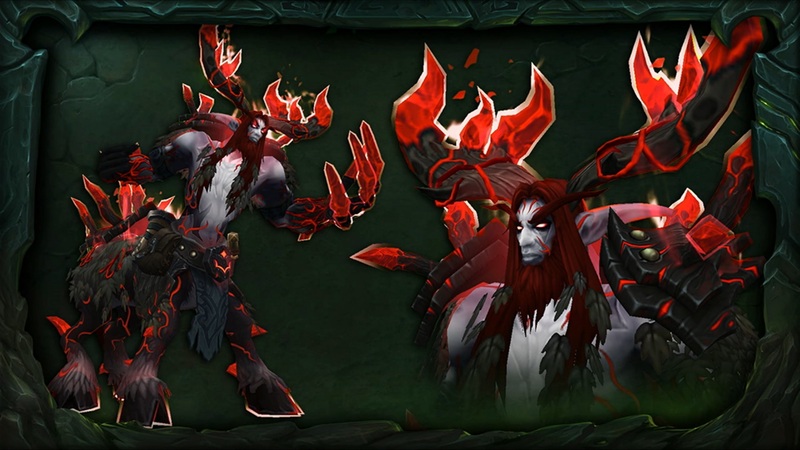 The Emerald Nightmare will contain 7 bosses and open a few weeks after launch, similar to Highmaul. Inside you’ll fight, among other things, Xavius, corrupted members of the green dragonflight, and–I thought this was pretty awesome–the one and only Cenarius, fully corrupted by the Nightmare’s blight. I’m pretty stoked. This is the raid I’ve been waiting for for a long, long time (still wish it was a full expansion), and I don’t think Blizzard are going to disappoint. The brief video they showed of the place looked amazing. Additionally, Blizzard is pushing to make dungeons central to Legion–or so they say–but I’m not sure that it’s going to have a real impact. I think most of us were quite relieved to discover that dungeons were one and done in Warlords of Draenor. It made them unique and enjoyable rather than mindnumbingly repetitious grinds. Blizzard are putting a lot of effort into redesigning dungeon scaling and reward systems for challenge mode, but it frankly sounded like an excessively complicated waste of time that no one is going to bother playing anyway. (Honestly, how many people do you know who do challenge modes? Out of a maxed out realid list of 100 people I can think of approximately zero.) But if that’s your gig, it sounds like there will be additional tiers of difficulty which incorporate additional mechanics. There is something that might be a new major city but probably isn’t: Suramar. Elves created a barrier to protect the ancient capital of Suramar during The Sundering 10,000 years ago, and they have been living behind it ever since, unaware that the War of the Ancients was ever won. The city was described as “one of the most ambitious projects that this team has ever done”. Blizzard explained that the leader of the city turned over to the Burning Legion, and one speaker let it slip–seemingly by accident–that Dalaran will be moving to the Lost Isles from Northrend, so I doubt there will be a traditional hub here. “The Grand Palace of Suramar” is a raid, and the city features two dungeons. Yet Blizzard mention “aiding your allies in Suramar”. I’m not sure what to make of that, and wonder if the city will be divided into a “safe-zone” hub and the occupied districts. Is Suramar City a city or just a questing zone like Shattrath in Warlords of Draenor, but with a raid and dungeons stuck in the middle? Hard to say. One thing Blizzard definitely confirmed is that we will be able to see it. Visibility distance will be increased to three times its current level. That might honestly be the most exciting announcement about the whole expac for me, and a pretty cool reason to go re-explore the world. There will be moose, games where you roll around in a barrel, and male banshees (manshees). All of these points received special attention because 😕 why shouldn’t they? Blizzard made no mention of whether or not there would be level 110 flying. I think no flying had a tremendously positive impact on Warlords of Draenor. It felt like the largest expansion in the game by far–a place you could get lost in like nothing since Vanilla WoW. But the decision saw its fair share of opposition, so it’s hard to say whether they’ll repeat the process in Lost Isles. World of Warcraft: Legion is due out in mid-2016. It looks pretty good, and has manshees.